A winter emergency use product. The Winter Rescue Formula of Diesel 911 restores the flow of diesel fuel to an engine caused by gelled fuel or frozen fuel-filters. 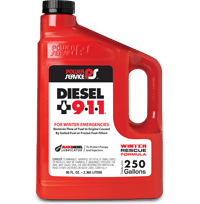 Diesel 911 is a winter emergency use product. This Winter Rescue Formula reliquefies gelled fuel and de-ices frozen fuel-filters to restore the flow of diesel fuel to an engine. Diesel 911 does not prevent fuel gelling – use Diesel Fuel Supplement +Cetane Boost (in the white bottle) as a preventive measure to keep fuel from gelling. Diesel 911 and Diesel Fuel Supplement +Cetane Boost are compatible in diesel fuel and may be used at the same time. To ensure peak performance of your diesel, Power Service recommends this Year-Round Maintenance Schedule. Check out our video for more information. If temperatures are above 30°F., add Diesel Kleen +Cetane Boost (silver bottle) to clean injectors, boost power, lubricate pumps and injectors and restore lost power and fuel economy. If temperatures are below 30°F., add Diesel Fuel Supplement +Cetane Boost (white bottle) for winter operability. It prevents fuel gelling and protects against fuel-filter icing. Use Diesel 9•et;1•et;1 to reliquify gelled fuel and de-ice frozen fuel-filters if your vehicle will not start or gain power in cold weather. 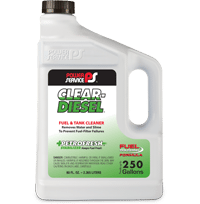 Treat with Clear-Diesel Fuel & Tank Cleaner to remove water, disperse contaminants and ensure fuel is stabilized for long-term storage. 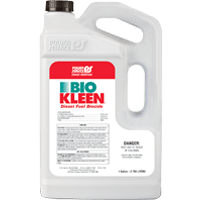 Treat with Bio Kleen Diesel Fuel Biocide to kill the microbes and Clear-Diesel Fuel & Tank Cleaner to remove the residual water and contaminants. 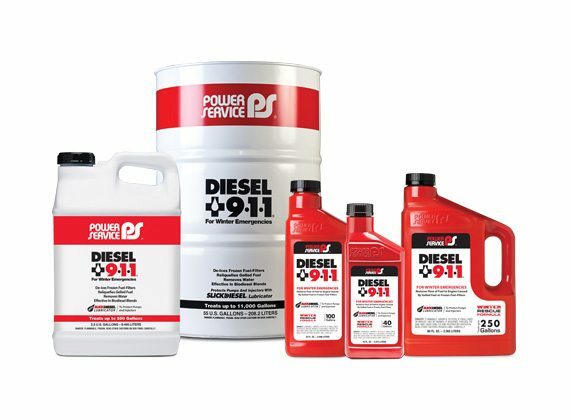 Diesel 911 does not prevent fuel gelling – use Power Service Diesel Fuel Supplement +Cetane Boost (in the white bottle) as a preventive measure to keep fuel from gelling. 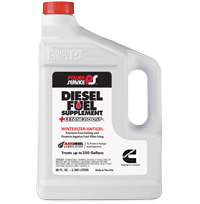 Diesel 9•1•1 and Diesel Fuel Supplement +Cetane Boost are compatible in diesel fuel and may be used at the same time. This product is to be added to the fuel. DO NOT ADD TO THE DIESEL EXHAUST FLUID TANK. 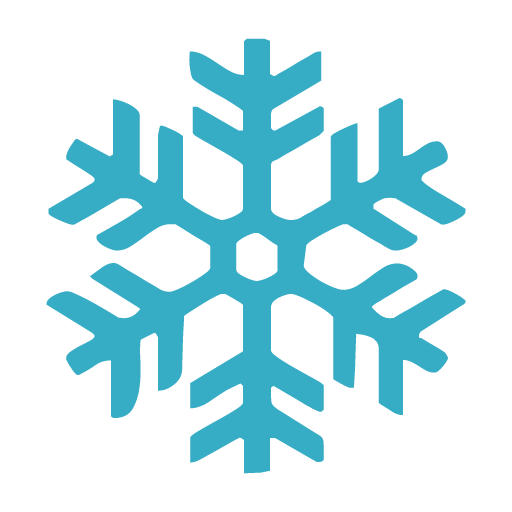 TO DE-ICE FROZEN FUEL-FILTERS: If fuel is liquid in fuel tanks but engine won’t start: Remove fuel-filters and fill with 50% Diesel 911 and 50% diesel fuel. Reinstall fuel-filters. Start engine. Add Power Service Diesel Fuel Supplement +Cetane Boost as directed to prevent fuel gelling. 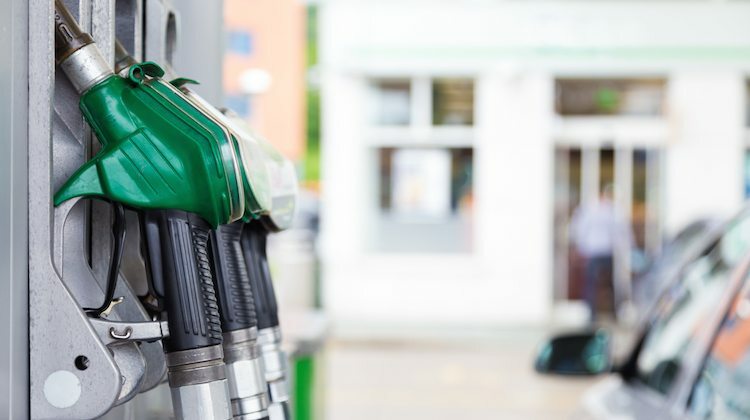 TO RELIQUEFY GELLED FUEL: Add 16 ounces of Diesel 9•1•1 to each 20 gallons of fuel in the tanks. Remove fuel-filters and fill with 50% Diesel 9•1•1 and 50% diesel fuel. Reinstall fuel-filters. Start engine. Let engine idle to warm up fuel system. Add Power Service Diesel Fuel Supplement +Cetane Boost as directed to prevent fuel gelling. TO REMOVE WATER AND PREVENT FUEL-FILTER ICING: Add entire contents (16 ounces) to 40 gallons of diesel fuel. For biodiesel blends, add entire contents (16 ounces) to 20 gallons of diesel fuel. TO DE-ICE FROZEN FUEL-FILTERS: If fuel is liquid in fuel tanks but engine won’t start: Remove fuel-filters and fill with 50% Diesel 9•1•1 and 50% diesel fuel. Reinstall fuel-filters. Start engine. 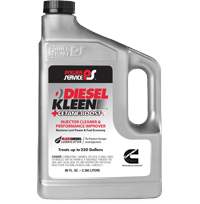 Add Power Service Diesel Fuel Supplement+ Cetane Boost as directed to prevent fuel gelling. TO RELIQUEFY GELLED FUEL: Add entire contents (32 ounces) to each 40 gallons of fuel in the tanks. Remove fuel-filters and fill with 50% Diesel 911 and 50% diesel fuel. Reinstall fuel-filters. Start engine. Let engine idle to warm up fuel system. Add Power Service Diesel Fuel Supplement +Cetane Boost as directed to prevent fuel gelling. TO REMOVE WATER AND PREVENT FUEL-FILTER ICING: Add entire contents (32 ounces) to 100 gallons of diesel fuel. For biodiesel blends, add entire contents (32 ounces) to 50 gallons of diesel fuel. TO RELIQUEFY GELLED FUEL: Add entire contents (80 ounces) to each 100 gallons of fuel in the tanks. Remove fuel-filters and fill with 50% Diesel 911 and 50% diesel fuel. Reinstall fuel-filters. Start engine. Let engine idle to warm up fuel system. Add Power Service Diesel Fuel Supplement +Cetane Boost as directed to prevent fuel gelling. TO REMOVE WATER AND PREVENT FUEL-FILTER ICING: Add entire contents (80 ounces) to 250 gallons of diesel fuel. For biodiesel blends, add entire contents (80 ounces) to 125 gallons of diesel fuel. TO REMOVE WATER AND PREVENT FUEL-FILTER ICING: Drain tank bottoms until diesel fuel appears. Add one gallon to each 200 gallons of diesel fuel. Completely blown away. I had a Water In Fuel message pop up. I drained the separator 3 times. Continued to get the message. I saw no water in what I drained. Truck was now in limp mode. Took it to the dealer after being stranded for 4 days(I’m a hotshot hauler) at a truckstop because of a holiday. Dealer said there was water in the fuel. I asked to see this water. There wasn’t any. That’s just what the computer was telling them. Found out there was a Ford service bulletin stating some biodiesel can get moisture levels that are not regulated. The remedy was a $700 system flush and refill. Plus the cost of the dumped fuel and new fuel. I was at a loss. A friend had just been talking about 911. They let me run down to the store. I put this product in, shook the truck, started it, no lights or messages. It dissolved the moisture immediately. I mean as soon as it hit the tank. Been driving for 300 miles so far with no issues. I’m a bottle carrying believer now. Diesel 911 has worked great for me every winter. I add it to my tank in my RV and let it run for 10 minutes and every spring it starts right up with no gel problems. 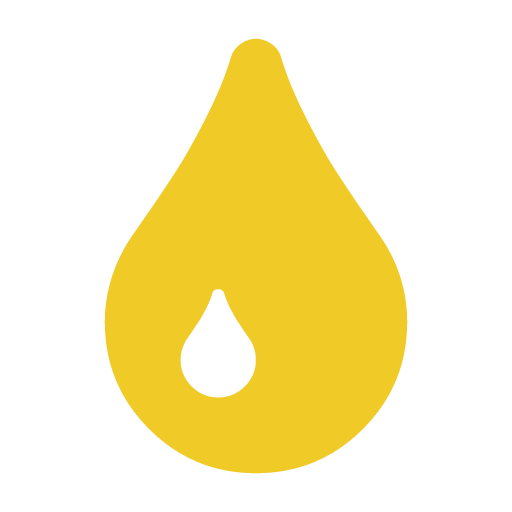 What Type of Diesel Vehicle Do You Operate? Water is dissolved in and carried by all diesel fuels. At temperatures below + 32°F., water that has collected in fuel-filters freezes. 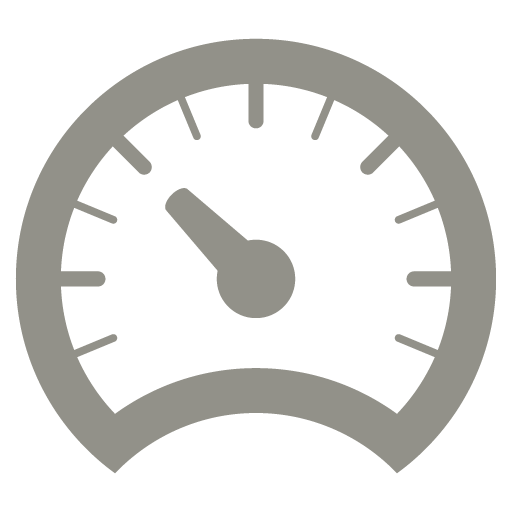 This causes decreased fuel flow to the engine and results in reduced engine power or engine shutdown. Diesel Fuel Supplement +Cetane Boost prevents fuel gelling and protects against fuel-filter icing. I just realized I have lost 25% on 5 years of fuel expenses on my 3/4-ton dodge! For the last five years I have been getting 16mpg (hand calculated). 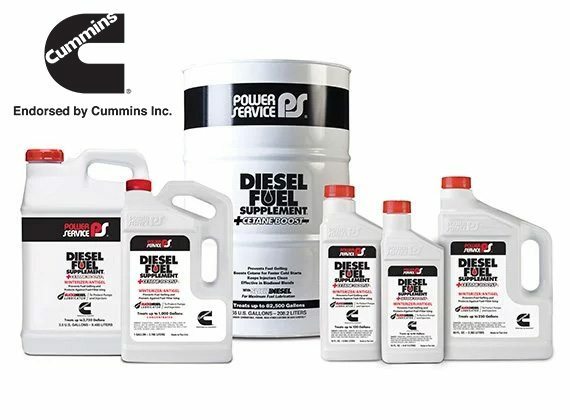 Spoke with ‘Cleetis’ who runs his cummins for work, and he recommended Power Services–dumped 100gal treatment into 30-ish gal. Drove 300mi today and filled up. Hand-calculated and 20mpg!!!!!!!!!! Thought it was only for powerstrokes… wow—thanks!!! !